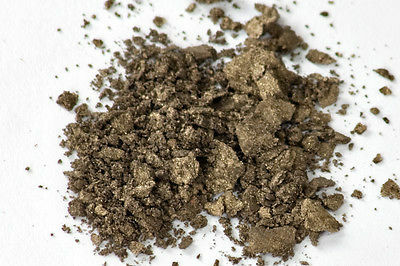 Home / Blog / Eye Makeup for Brown Eyes: Stand Out from the Crowd! 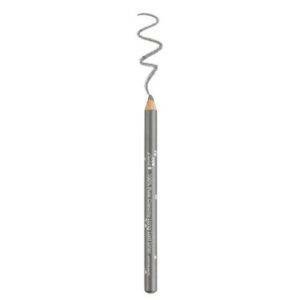 by Lora37 Comments on Eye Makeup for Brown Eyes: Stand Out from the Crowd! Hello, my gorgeous brown-eyed Girls! 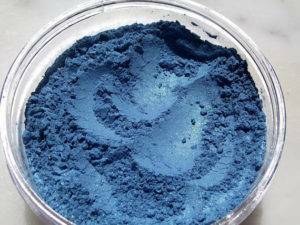 This is part one of my five-part series on the best eye makeup for your eye color. Have you ever felt like you have the most boring eye color out there? Let me assure you this is not the case! 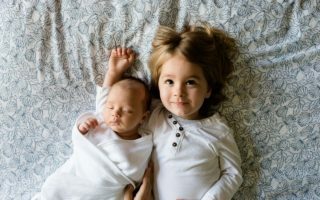 While you do have the most common eye color in the world, not all look the same. There are so many lovely shades from deepest ebony to golden amber. In fact, your “common” eyes can be your greatest asset. A very neat and sometimes overlooked advantage of having darker eyes is that you are actually able to wear more colorful looks. The contrast level of your eye color gives you more options in that regard. 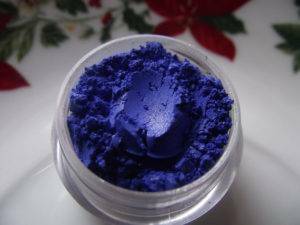 Take that, blue eyes! 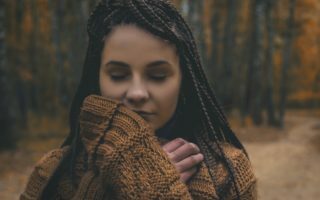 So, if you feel like you are looking a bit blah and want to know how to get out of this beauty rut, I will tell you. 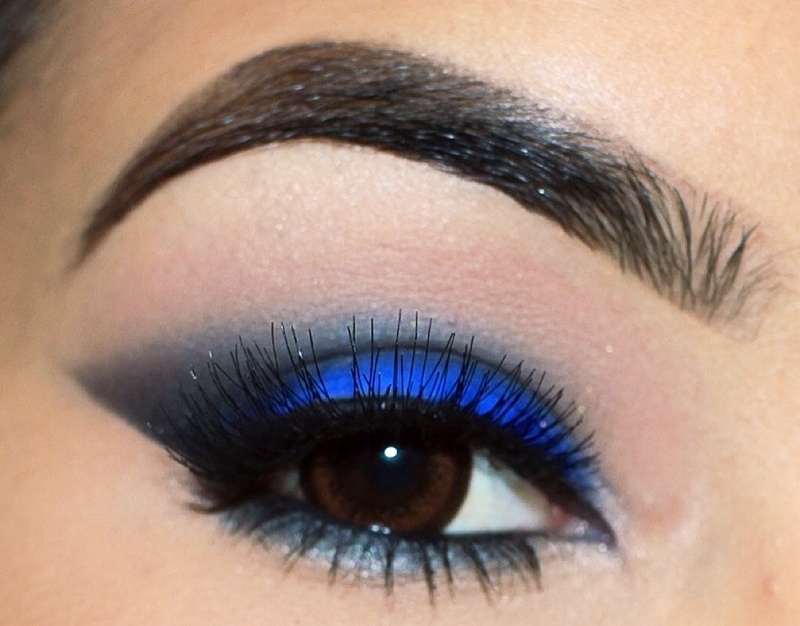 The key to making your eyes look amazing is choosing the right colors of eye makeup. 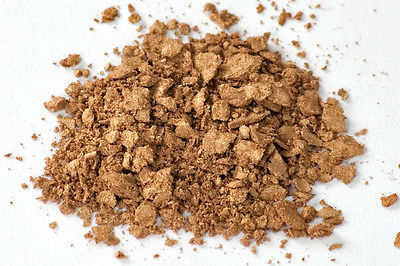 By knowing which colors to apply for your lovely shade of brown, you can really make your eyes sparkle. 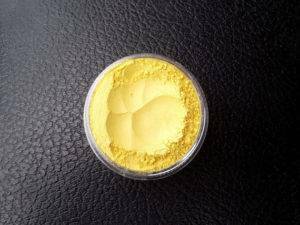 Not only will the perfect colors make them stand out, they will look bigger, brighter, and more awake. Who doesn’t want that? As simple as this sounds, this is something some women really struggle with and like I said earlier not all brown eyes are the same. Someone with black eyes is not going to look good in the same makeup as someone else with golden or amber colored eyes and vice versa. Here is a guide to help make it a little easier and clearer. 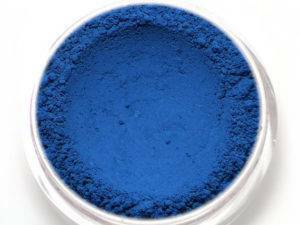 Shades of blue (which is will contrast with the warm orange undertones in your eye) like turquoise or navy blue. 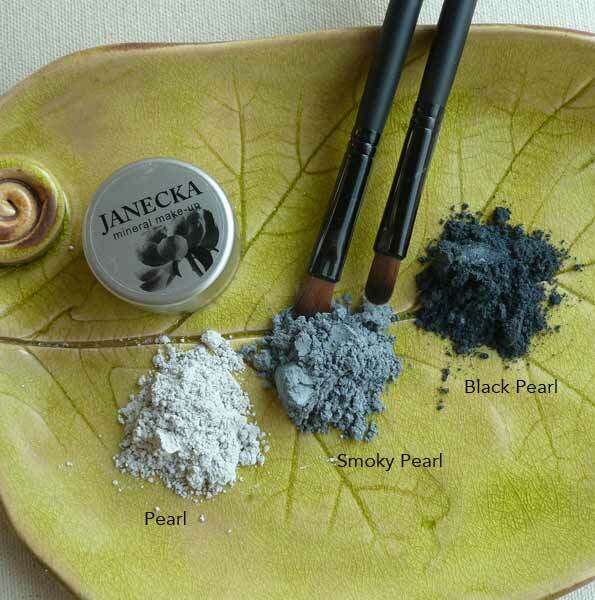 Dark olive, teal, deep purple, bronze or chocolate liner will make your eyes pop. 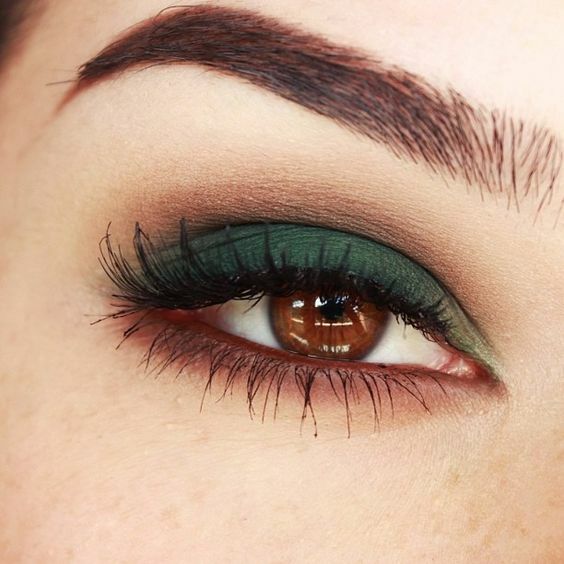 Choose black, dark green, aubergine or dark brown mascara. 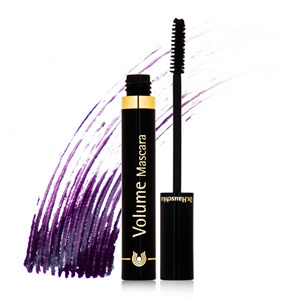 Aubergine mascara is gorgeous on golden and amber brown eyes. 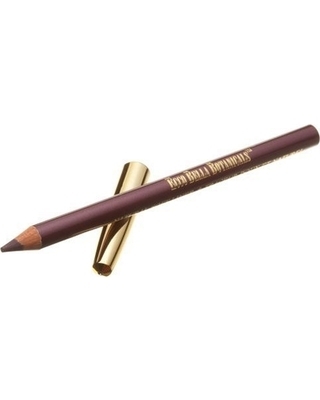 Zuzu Luxe Eyeshadow in Egyptian Gold and the Ecco Bella Soft Eyeliner Pencil in Bronze can help you give you the looks above. In the mood for a more dramatic look? 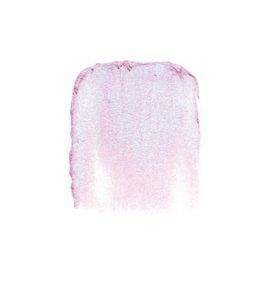 Try Zuzu Luxe Eyeshadow in Ice Princess paired with Aubergine mascara from Dr. Hauschka. 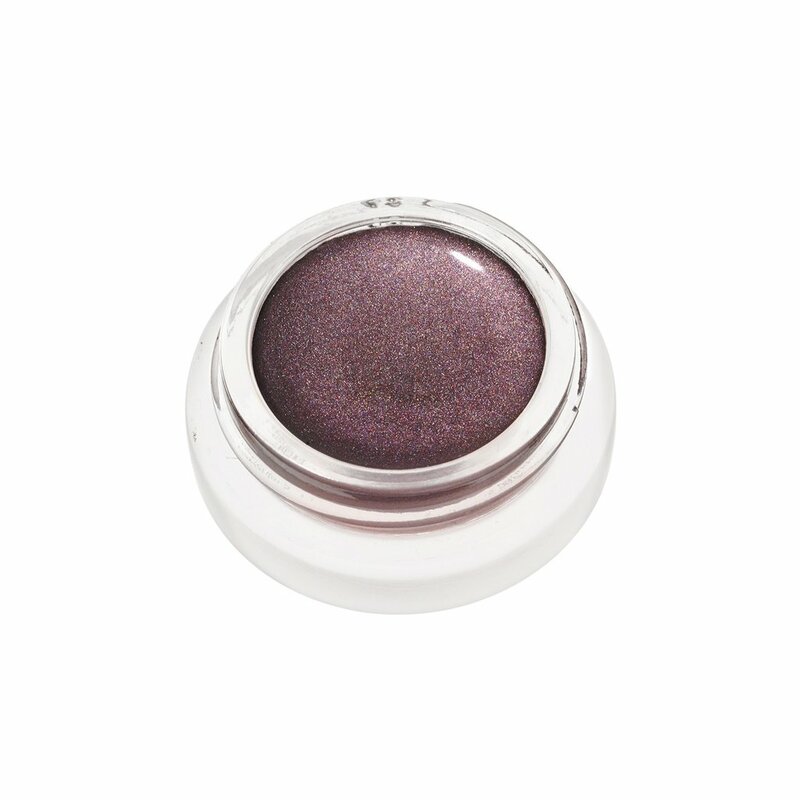 The RMS Beauty Eye Polish in Imagine, Soft Eyeliner Pencil from Ecco Bella in Violet would look lovely as well. 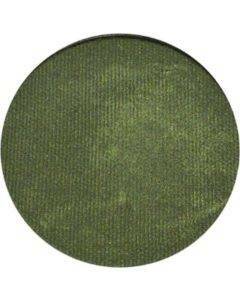 Look like a green goddess in the shade Absinthe from Zuzu Luxe or Conspiracy from Honeybee Gardens. 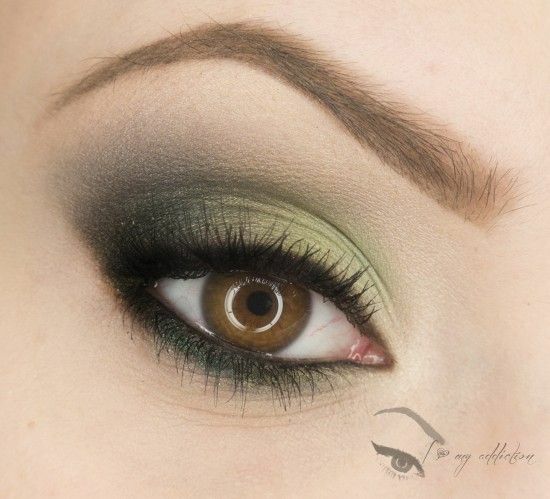 If wearing green shadow is not your thing try adding just a touch to your eyes with a dark golden green mascara. 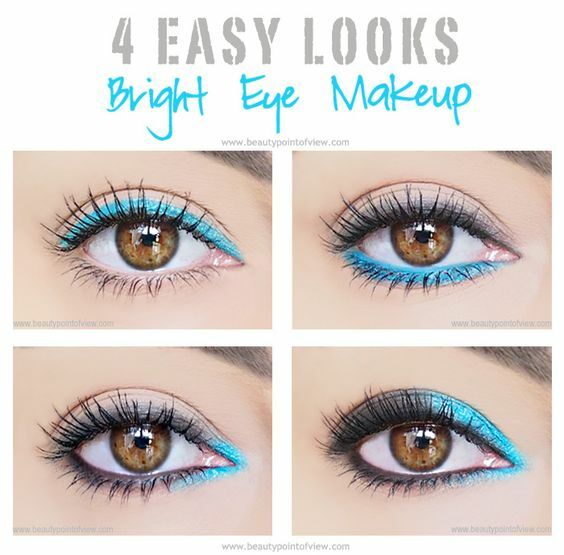 Turn the volume of your look way up by adding a bright turquoise accent to your eyes. 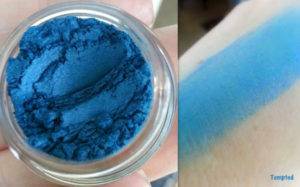 You can get this look with the shadow Pool Party from TaterRoundsBeauty or the shade Tempted from Addictive Cosmetics. 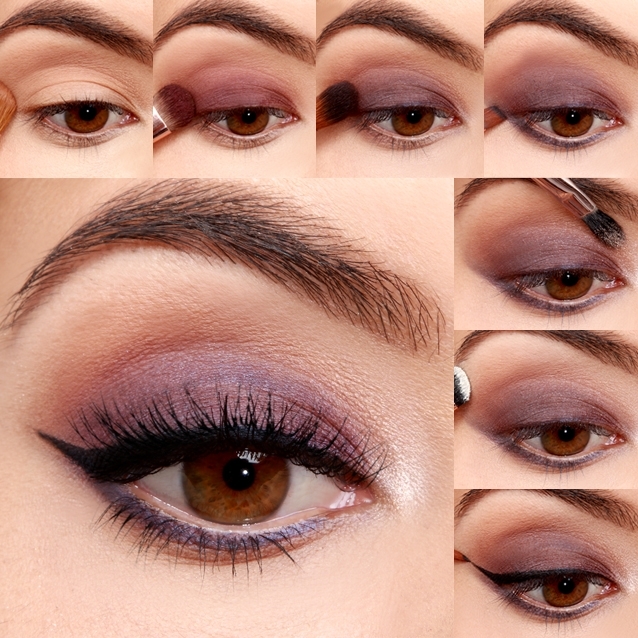 Black, gunmetal gray, dark smokey purple, dark peacock or deep blue eyeliners will give your eyes that wow factor. 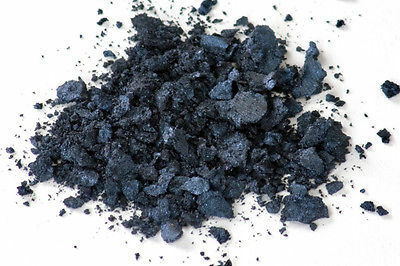 Mascara in deepest black, black-brown or navy will pull it all together. 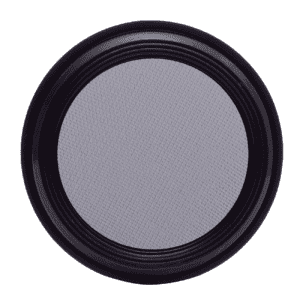 Tap into your ethereal side with a pretty pastel shadow like Zuzu Luxe Eyeshadow in Skylar or Misty Blue eyeshadow from Real Purity. 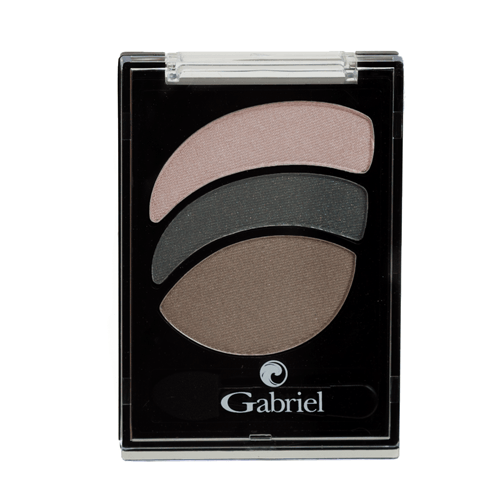 Get the perfect smokey eye using the Gabriel Cosmetics Eyeshadow Trio in Smokey Shimmer or the Janecka Mineral Eyeshadows in Pearl, Smokey Pearl, and Black Pearl. 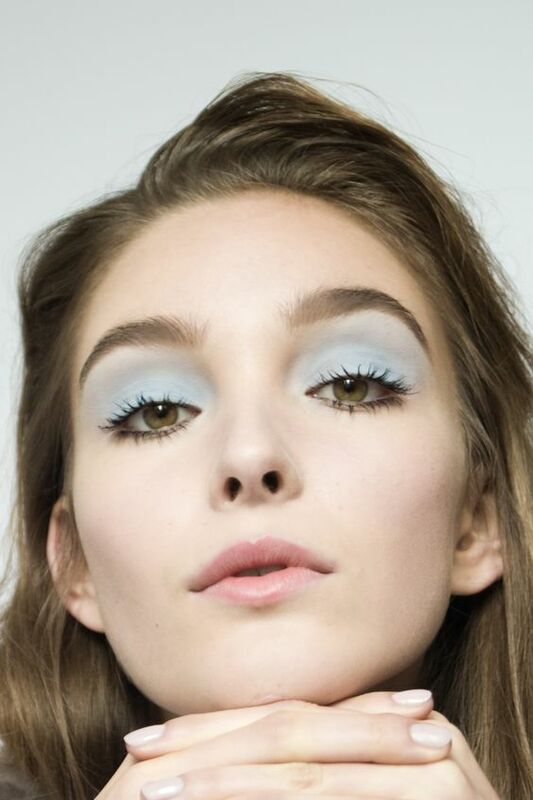 Add a bold pop of blue to your eyes with the shade Boni Blue Eyes from TaterRoundsBeauty or Lazuli from Etherealle Cosmetics, strategically placed in the center of the eyelid or all around the eye, balanced with an application of black liner and mascara with touches of silver using 100% Pure Cosmetics Gleaming Pewter Creamy Long Last Liner. 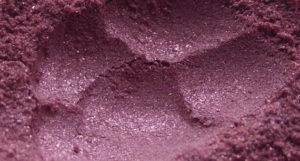 Add a gorgeous wash of color to your eyes with a shimmery pink shadow like Evening Sky from TaterRoundsBeauty or Mesmerize Eye Color Radiant Shadow Stick in Cinder from Vapour Organic Beauty. Turn things up a notch by applying a bold streak of neon yellow above your black winged eyeliner. 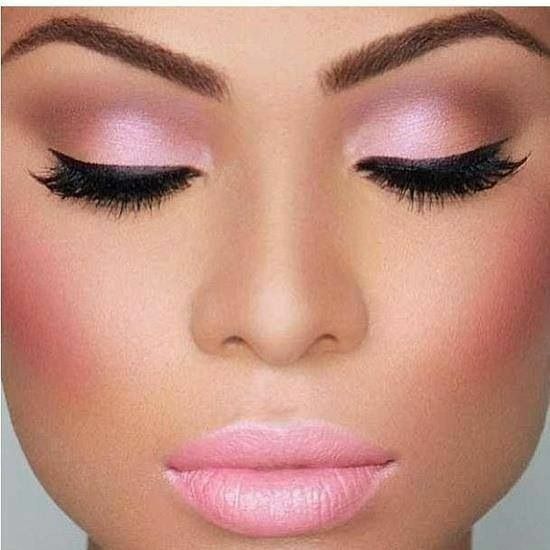 You can achieve this look with TaterRoundsBeauty Satin Eyeshadow in Sun Flower. 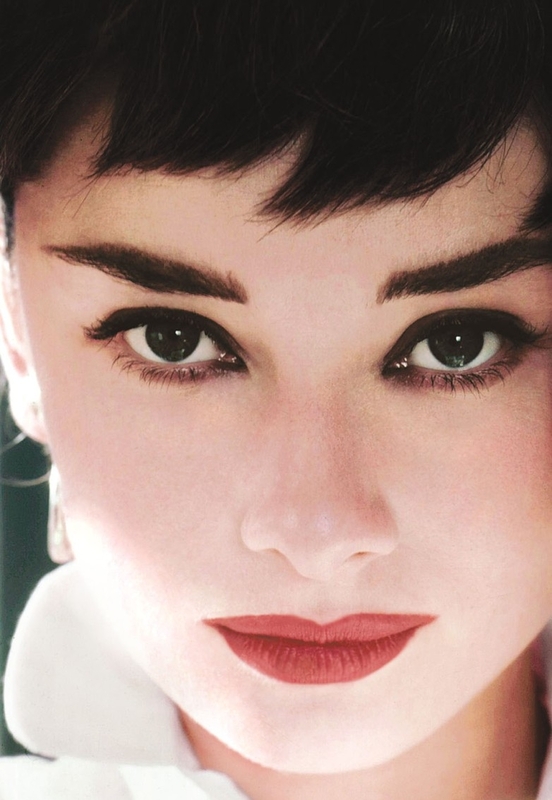 As a closing thought, some of the most beautiful in the world share your eye color. 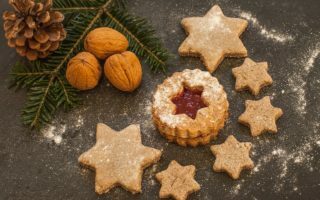 Think Beyonce, Jessica Alba, Julia Roberts, Audrey Hepburn, Judy Garland, Kim Kardashian, Catherine Zeta-Jones, Winona Ryder, Keira Knightley, Natalie Portman, Jennifer Garner, Anne Hathaway, Lucy Lui and many others. Be proud and rock it, ladies! 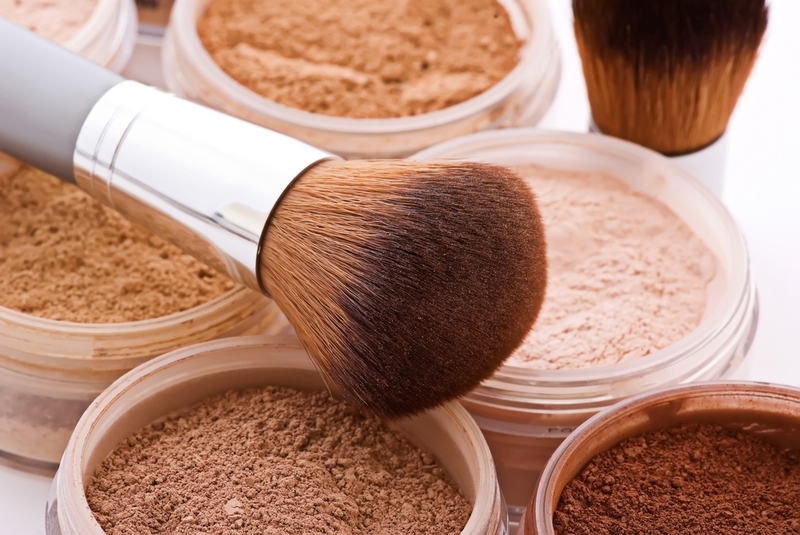 Next ArticleMakeup Tips for Older Women: Looking Fabulous at 50 and Beyond! Thank you very much! I appreciate you taking the time to leave a comment. Glad you like my post.